In May 2008, Susan and Jose Moreno opened Moreno's Bakery with three employees in a 2500 square foot storefront in Brandon. "We were lucky to do $100 in sales per day back then," says Ms. Moreno. "Eleven years later, we now serve 600-1000 customer per day and have 50 employees." Ms. Moreno cites her husbands baking skills and her advertising instincts for the success of their Tampa Bay small business. Ms. Moreno further credits a mix of cable TV advertising and commercials on Tampa radio stations with Moreno's Bakery's incredible growth trajectory. "Our first year was a struggle," says Ms. Moreno. "We were open for just a short time before the recession hit. I knew to survive we needed to advertise." At the beginning, the Moreno's plowed 50% of every sale into the advertising budget. "We started out using cable TV," says Ms. Moreno. "We could affordably purchase schedules that reached cable subscribers who lived very close to the bakery." "Almost right away," she says, "we started to see new customers. It was the middle of the recession and we were growing. It was remarkable." In 2013, Moreno's Bakery outgrew its original storefront. "By then we had 25 employees who were working elbow to elbow." So, the business moved less than one-tenth of a mile to a new 10,000 square foot location. Cut Back On TV. Add Radio Advertising. In 2017. Moreno's bakery cut back on it's cable advertising and began to advertise on Tampa Bay Radio. "It was actually Jose's idea," says Ms. Moreno. "He listened to his favorite Tampa radio all the time and wanted to experiment with some commercials. I was skeptical at first, but I knew that a lot of people with cable were skipping through commercials or cutting the cord completely and switching to Netflix. This was leaving a big hole in our reach." In almost no time, Ms. Moreno converted from skeptic to true-believer. "Pretty quickly, new customers were coming in and telling us they learned about us on the radio. It seemed to be working so well we began to add additional Tampa radio stations." 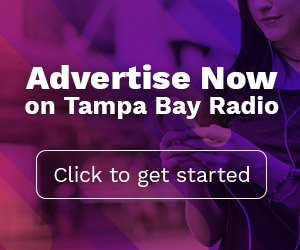 The Moreno's decision to reallocate a large portion of their advertising budget away from television and reinvest it on Tampa radio stations foreshadowed the results of a recent study by Nielsen. The purpose of the research was to determine how combining radio and TV could improve the outcome of an advertising campaign. The study, commissioned by Westwood One, looked at a campaign designed to compel consumers to tune-in to a new show on a national cable network. The campaign utilized both TV and radio advertising. According to the study, the consumers who were most likely to tune-in to the new show did so because they had been exposed to the advertising at least six times. 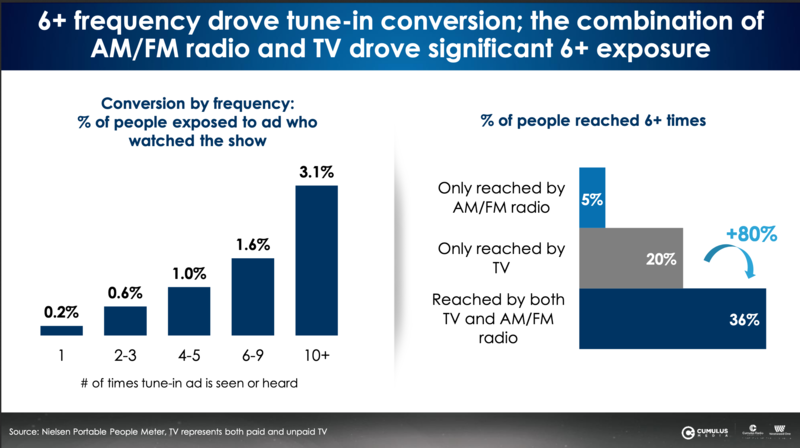 The chart below shows that combining radio and TV messages increased the number of people who were reached by 80% versus just using television advertising alone. 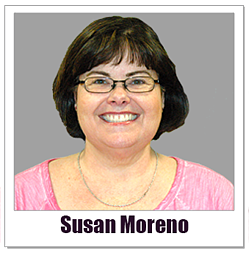 Ms. Moreno is convinced that her successful advertising on Tampa radio stations is helped by the inclusion of personality endorsements into her radio schedules. "The radio personalities we use in our advertising have a very strong connection with their audience. The listeners trust them like friends," says Ms. Moreno. "So when the DJs personally recommend our bakery, it brings a lot of credibility to us." Again, a collection of research supports Ms. Moreno. According to a study by a Vision Critical/MARU Nation Study, more than half of radio listeners view radio station personalities like a friend or family member. Most importantly, 55% of radio listeners trust a product or service more when endorsed by their favorite radio personality, according to a Presslaff Interactive F.C.T report. Finally, a study by the USC/Annenberg School For Communication & Journalism finds that 49% of radio listeners say that DJ recommendations increase the perceived value of brands, products, and services. Ms. Moreno, who was once skeptical about advertising on Tampa radio stations, now runs commercials 52 weeks per year. What is her advice for other business owners for achieving success with radio advertising? "Invest in enough frequency to be heard. Use personality endorsements if you can. And, stick with it. It could take several months before you see results."